JOHN HAGON. When pursuing our 17th– century Kent ancestors it is a surprise to find a Kentish bride marrying a groom from Norfolk. John Hagon was baptised in Great Yarmouth, Norfolk in 1662. He was the son of Thomas Hagon and Elizabeth Cox. This date fits with his age of 28 at his marriage. Baptism. St Nicholas, Great Yarmouth. John appears to be the older of two children. There was a younger sister. We have not found his father’s burial in Yarmouth. If he was a mariner like John, then he might have been lost at sea. If this happened early in the marriage, it would explain why there were no further children. His mother was a widow when she died in 1692. John is described on his marriage licence as a mariner from N Yarmouth. 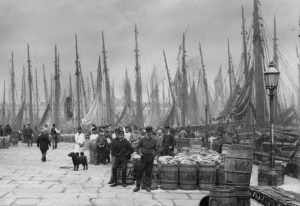 Yarmouth is an antient town, much older than Norwich; and at present, tho’ not standing on so much ground, yet better built; much more compleat; for number of inhabitants, not much inferior; and for wealth, trade, and advantage of its situation, infinitely superior to Norwich. It is plac’d on a peninsula between the River Yare and the sea; the two last lying parallel to one another, and the town in the middle: The river lies on the west-side of the town, and being grown very large and deep, by a conflux of all the rivers on this side the county, forms the haven; and the town facing to the west also, and open to the river, makes the finest key in England, if not in Europe, not inferior even to that of Marseilles itself. The ships ride here so close, and as it were, keeping up one another, with their head-fasts on shore, that for half a mile together, they go cross the stream with their bolsprits over the land, their bowes, or heads, touching the very wharf; so that one may walk from ship to ship as on a floating bridge, all along by the shore-side: The key reaching from the drawbridge almost to the south-gate, is so spacious and wide, that in some places ’tis near one hundred yards from the houses to the wharf. In this pleasant and agreeable range of houses are some very magnificent buildings, and among the rest, the custom-house and town-hall, and some merchants’ houses, which look like little palaces, rather than the dwelling-houses of private men. The greatest defect of this beautiful town, seems to be, that tho’ it is very rich and encreasing in wealth and trade, and consequently in people, there is not room to enlarge the town by building; which would be certainly done much more than it is, but that the river on the land-side prescribes them, except at the north end without the gate.. It was in this northern part of Yarmouth that John Hagon lived. In 1719 Defoe had also published Robinson Crusoe, in which his hero sets sail from Great Yarmouth. MARY SCOTT was the daughter of George Scott and his wife Elizabeth. She was baptised in Deal on 19 Mar 1670/1. Her parents’ marriage has not been found, so we do not know her mother’s surname. She was the second child in a family of four. We do not know how John and Mary met. As a mariner, John may have been a fisherman following the shoals south to Kent. Or he may have served on a cargo ship, calling in at Deal. John was still regarded as “of North Yarmouth” when they married, but he brought up his family in Deal. 1691 Jun 1 John Hagon, 28, Mariner of N Yarmouth, Norfolk & Mary Scott of Deal, aged 21. They had six children baptised in Deal. 1706 Nov 24 Richard. His surname is given as Haggen. There is no evidence of any of their children dying young. In 1736 their youngest daughter Lydia married Henry May. No burial has been found for John or Mary in Deal or elsewhere in Kent.